Unsure how to manage your busy schedule and get in those last minute edits? Consider using this effective content management template. 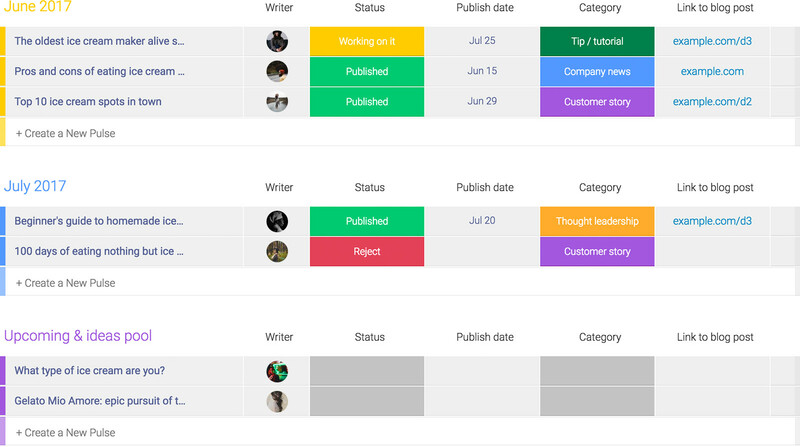 You’ll be able to track and organize all your ideas and content tasks. You can use different colors and labels to customize it according to the content type, clients, topics, assigned writer, and more. By implementing this template into your content management strategy, you’ll be able to easily construct a well-thought content plan and develop a clear and visual method of sorting your marvelous ideas. Our template is perfect for content writers seeking to navigate the roads of their imagination, it can be adapted to suit any and all content needs. This template removes the time-consuming logistics behind content marketing and allows you to focus on creating valuable content for your audience. It allows you to insert all the tasks directly on the board and to store, overview, track and organize all brilliant content ideas that may strike you. Adopt this template to considerably enhance your content plan. You’ll be able to group your content per month, or even have a group named “ideas” that can be used to plan the upcoming month by dragging each idea to its allocated time. Have you ever found yourself in a content pickle? So many ideas, but no clear way to organize them. Even worse, sometimes there are too many getting in the way of creating valuable content. Having a content management template board on monday.com is hands down the perfect solution to building the foundations of your content plan.